The very first thing that crosses our minds when nonstick cookware is mentioned is their ability to release food impeccably. This is due to the hectic hustle that surrounds cleaning cookware especially where a dishwasher is not applicable. However, Bialetti ® Ceramic Nonstick Cookware solves it all. This model is greatly known because of its simplistic, high quality, stylish designs and functionality. It features a ceramic nonstick interior together with hard anodized construction. The good this about the appliance is that it has a hard-anodized aluminum exterior, that ensures durability making it twice tough compared to stainless steel. 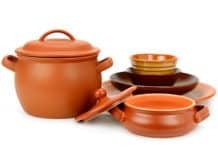 Bialett ceramic nonstick cookware conducts and distributes heat faster and evenly. It has a gray ceramic cooking surface which make it use less oil while cooking. The beauty of these appliances is that they heat quickly and are versatile. 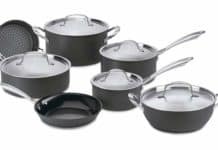 They are also oven-safe and can heat up to a temperature of 400 degrees F which is higher than other nonstick cookware. The handles of the unit are stainless steel. This gives them a better heat resistance. 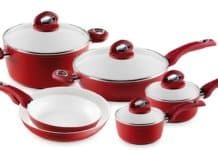 Bialetti ® Ceramic Nonstick Cookware is a high profile cookware that will ensure that in your cooking, you will always get professional results. The good-looking design is unbelievably durable. The solid construction has an extraordinarily hard anodized exterior. The material is two times harder than stainless steel! This ensures that the cookware will last as long as you need it. 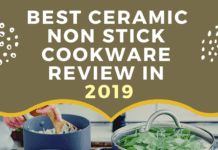 The nonstick ceramic also adds onto its hardiness. 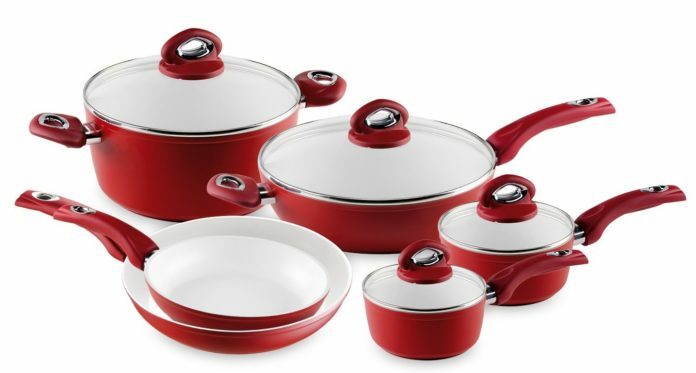 The cookware has a 10-year warranty which is a guarantee for quality and durability. The tough sturdy construction does no however compromise its elegant look. The high profile yet affordable design is good-looking with a very resilient feel. 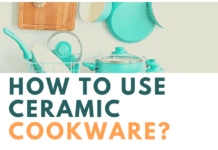 There are so many reasons as to why you may need to carry the cookware when cooking. need may arise to switch the stove and this will mean carrying the hot cookware very carefully. A cookware with an uncomfortable handle is likely to cause accidents, which pause risks to the user. 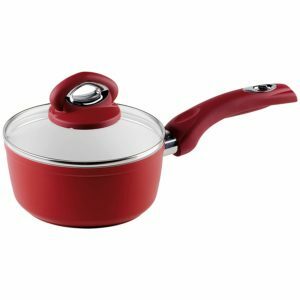 Bialetti ® Ceramic Nonstick Cookware has quality durable ergonomic handle that ensures a secure, firm, comfortable grip. This ensures ease in handling the cookware. The handle is also designed with a hole at the end for hanging which makes storing it easier and less space consuming. 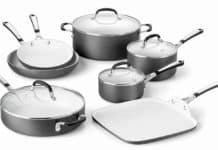 Polytetrafluoroethylene (PTFE) and Perfluorooctanoic acid (PFOA) are chemical compounds that are mostly used in the coating of most cookware in an attempt to make cleaning easier. The compounds have an ability to resist water and oil. Though they are minimally transferred to food, long term use of the same pauses risk to the user. When heated, the fumes produced are hectic making cooking a risk. With an outstanding ability to resist water and oil, Bialetti ® Ceramic Nonstick Cookware is free of this. This implies that when the cookware is accidentally overheated, the fumes produced are not hazardous. While cooking is fun, cleaning the dishes is not. In fact, it is most people’s worst nightmare. It is not only time consuming but also very tiresome and boring. For this reason, ideas like soaking the cookware immediately after cooking have come up, at least to reduce fatigue. Bialetti ® Ceramic Nonstick Cookware is widely known for its immaculate food release capabilities. This makes cleaning so easy not only saving time but also resources. 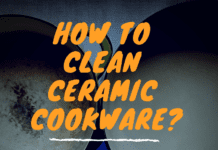 The ceramic cookware is easy to clean and requires less water. When cooking, monitoring food is very common. Opening and closing the lit is in turn very common. Bialetti ® Ceramic Nonstick Cookware has glass lids that allows you to monitor the food when the lid is closed without necessarily opening it. This not only makes cooking easier but also prevents moisture release. The lids have stay cool ergonomic handles that makes removing the lid when necessary very easy. The tight fitting lids also have vents which allows for moisture release which prevents pressure from building up. 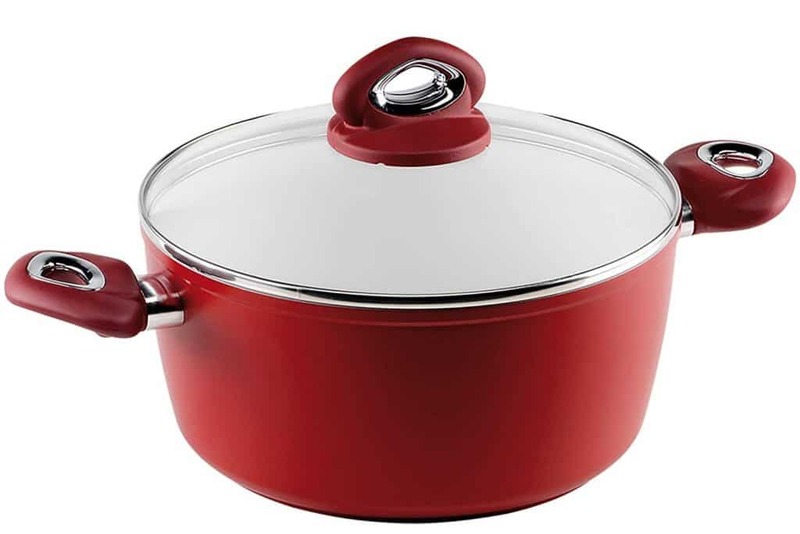 Note: while this cookware is very durable, it requires care and should be cleaned gently. This will incredibly prolong its life. Why should you use Bialetti® Ceramic Nonstick Cookware? Nothing looks great that the base of bialett ceramic nonstick cookware. This kitchen appliance has a thick base pan. This base is made using heavy gauge forged aluminum. This aluminum is best known for conducting and distributing heat excellently. The handles of the unit are stainless steel. They look attractive and make the kitchen look appealing. The stainless steel material makes them oven safe when they are riveted. This is a unit that is affordable and anybody can purchase it because of its effective cost. It offers great value for the money. This is the appliance that is suitable for a conventional stovetops that include electric, ceramic, gas and even glass. 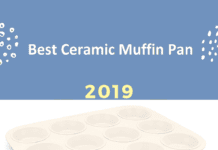 It is well priced and normally it comes with the guarantee which covers the item from manufacturing defects for around ten years from the purchase date. 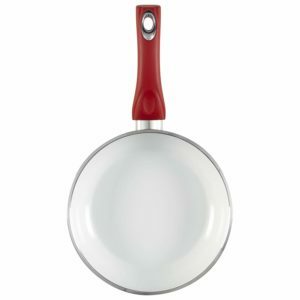 The coated surface area of the pan uses enables you use little oil while cooking. You can fry with the pan and use only less butter which is an advantage to your health. It may actually be not completely fat-free cooking, but it helps a lot in ensuring that you don’t take a lot of fat into your body. This model is bigger with a large saucepan. The saucepan comes with lids. They have exterior that looks attractive and are easy to clean. Since the base of the pan is made of aluminum, it makes it easier for the pan to distribute heat quickly. Heat is quickly and evenly distributed to the rest of the base for better cooking. The temperature of the appliance can be reduced so that it can cook perfectly. The handle is also stainless steel for better handling. The coating is absolutely great. It is coated with a nano ceramic coating. 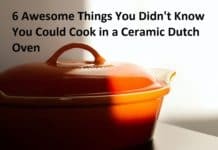 This coating is new and it is greatly beginning to become more common on different cookware. The good thing is that this coating is PFOA and PTFE free. Therefore no safety worries to think about. Which country is the unit made? What is the depth of 11 inch pan? While Bialetti ® Ceramic Nonstick Cookware may be a bit expensive compared to other cookware, it is undoubtedly worth your money. The high profile ergonomic design is designed with skill to ensure that cooking is made much easier. 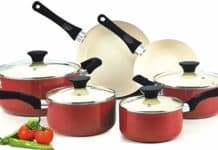 Its high heat conducting capabilities, ease of cleaning and efficiency makes it an all in one cookware that will not disappoint. It heats excellently and distribute heat well as described above.